What can be the flow chart of lab dips production? Lab dip is very important of dying factory. Because bulk production order depends on lab dips. A lab dip is a swatch of fabric that is made to test dye to meet the asking color standard. Lab dip plays a vital role in shade matching & this is an important task before bulk production of dyeing. Simply we can say that a lab dip is a swatch of fabric test dyed to hit a colour standard. To ensure the calculation of sample dyeing. For comparing purpose of dyed sample with spectrometer or light box. 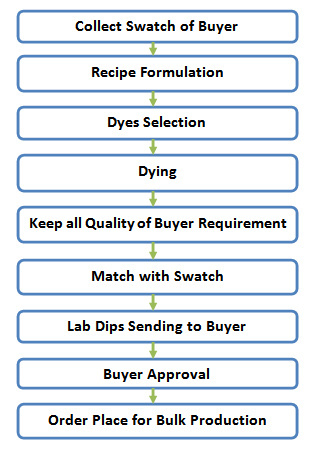 To get clear concept about recipe of sample dyeing. To get approval from buyer by meeting their requirements. **Swatch is a small sample which is generally provided by buyer. It indicates which exact shade what they are in need. Tagged Flow chart of Lab dip process, Flow Chart of Lab Dips Production.